It began with the stained-glass window. Tucked in a corner of the dining room, the shrinking violet’s subtle shades of aquamarine, red wine, and goldenrod were all but hidden from view, overwhelmed by busy wallpaper and layers of lacquer trim. Even its lead seemed withered. But the redesign plan for the circa-1882 Queen Anne Victorian near the water in Southport held something special in store for this vintage detail, something more apropos of the home’s stately provenance. So they didn’t. Paint it white, that is. Nor did they gravitate toward the traditional out of guilty respect. Rather, it is contrast and geometric patterns that transform this Gilded Age beauty into a welcoming retreat and entertaining haven. And it all originated with that overlooked stained-glass window. 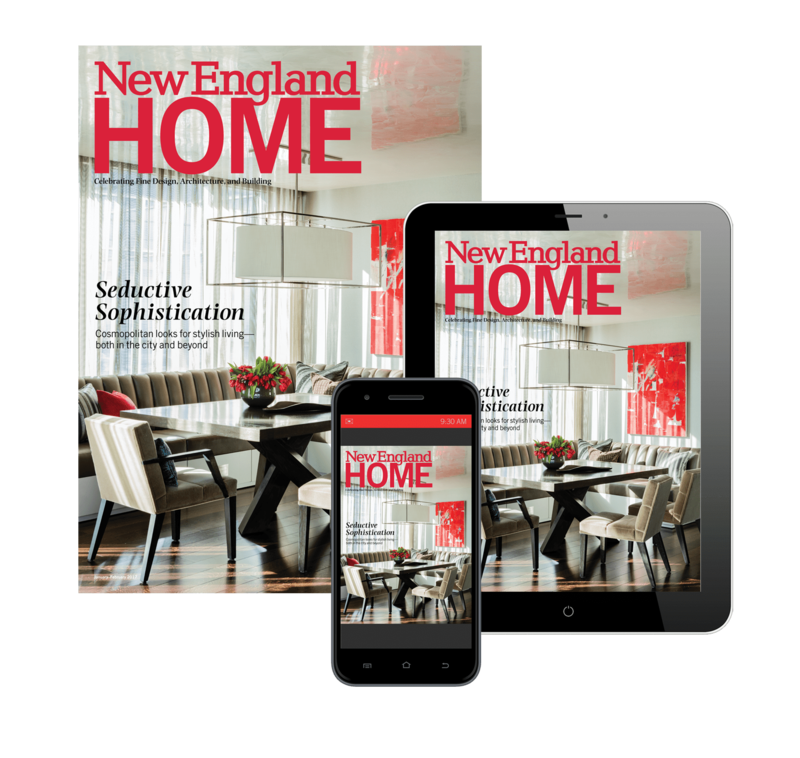 “That was the starting point for the color palette on the whole first floor, with touches of teal and maroon dotted throughout,” says Reider. Although the house comes across as colorful, Reider points out that the foundation is anything but. “It’s comprised of neutrals—whites, blacks, grays, and some metallic accents—with layers of jewel tones,” she says. Even in the show-stopping dining room, where the peacock trim and lotus wallpaper are standouts, the designer notes that upholstery in black and white, a geometric wool rug, and the family’s traditional dining table and chairs (now covered in a modern abstract fabric) form the nucleus of the novel new space. In the separate parlor, Reider went for a quieter look that relies more on texture to create interest. A muted grasscloth invites tactile discovery, and black-and-white furniture is enlivened with accents of gold and turquoise. The original wood trim throughout the first floor also received lots of attention from Taylor Moore of Moore Carpenters. His team of six “took off 100 years of paint, lacquer, stencils, and wallpaper, stripping it down to nothing and starting from scratch,” Moore says. Benjamin Moore’s Adriatic Sea washes across the dining room, causing jaws to drop the moment one walks through the front door. “That teal trim was something that really resonated with me,” says Sandi. 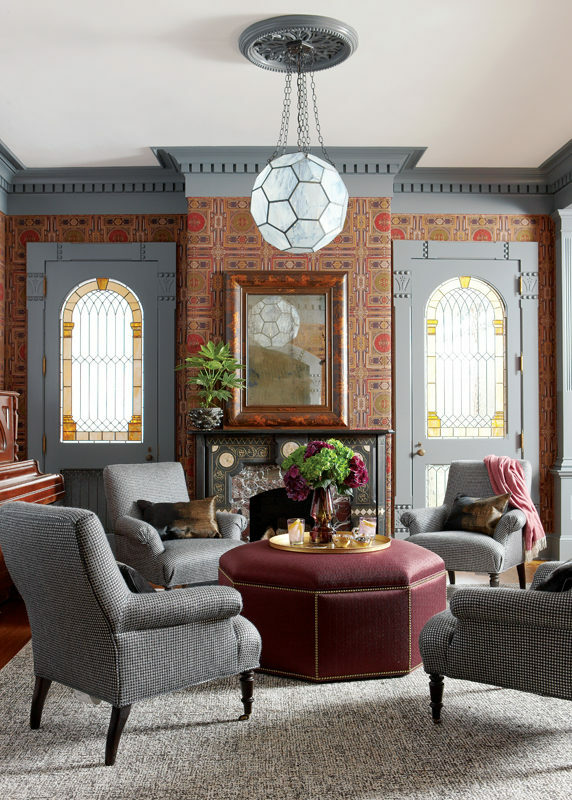 “In a circa-1882 house, you don’t expect to see statement wallpaper and teal trim, and I think that’s really fun.” A metallic wallpaper on the ceiling adds a magical glow for entertaining. Boldness billows into the foyer where eggplant trim and wainscoting in Farrow and Ball’s Brinjal is the ultimate compromise. “My husband and I went back and forth on the entry,” Sandi admits. “I wanted it to be light. He wanted dark mahogany because of the house’s history. But we both agreed to this purple wine color because at certain times of day you saw different colors.” White-on-white marbleized wallpaper adds a note of modernity and reflects light. The old house now has a fresh new look that respects and celebrates its history. Every room makes the family happy, and they can really unplug the moment they arrive. “We took who we are and what the house was, and synthesized them into a space that is very comfortable, extremely unique and special, and also something that feels very livable,” Sandi says. And the unassuming stained-glass window that kick-started the design now gets the attention it deserves.